I have quite a few things to share with you today including some suggestions for new additions to the library, our pending road trip schedule, an invitation to a great little event or two, and an opportunity for putting in your two cents worth. First, however, today is definitely a day for somber reflection. As with the assassination of President Kennedy (I was sent home from school early that dark day in November of 1963) people remember exactly where they were when first hearing the news of the unfolding disaster in New York City. As I reflect on that day fifteen years ago, what saddens me the most is the current state of the nation. In 2001, we were a nation united, a nation suffering through shared grief with neighbors, co-workers, and friends throughout the world. Today we are polarized and divided more than at any time in recent history. It was noted previously that I picked up a most interesting book at the airport in Frankfurt, To Hell And Back: Europe 1914 to 1949. The book is dry and a bit deep. It is also eerily timely; the rise of extreme right wing nationalism, currency crisis, manipulation of public opinion for consolidation of political power, utilization of regional conflicts as a means for bolstering weak economies that in turn result in a flood of immigrants that make ideal scape goats, unions and liberal coalitions fighting rapacious corporations that maximize profits at the expense of workers, abandonment of promises made to military veterans resulting in simmering anger, border crisis, and a collapse of public confidence in government. //ws-na.amazon-adsystem.com/widgets/q?ServiceVersion=20070822&OneJS=1&Operation=GetAdHtml&MarketPlace=US&source=ac&ref=tf_til&ad_type=product_link&tracking_id=jimhinsame-20&marketplace=amazon&region=US&placement=0141980435&asins=0141980435&linkId=47dea96585d628b39e1a2ac9b516231b&show_border=false&link_opens_in_new_window=false&price_color=333333&title_color=0066c0&bg_color=ffffff I strongly recommend this book. But don’t plan on a speedy read, take it in bites, and meditate on what was read. Okay, now for something a bit lighter – road trips. The schedule for October is almost finalized. However, I still can squeeze in a presentation or two for organizations, museums, or as a community event, or an interview. And I most always have time to visit with friends and friends yet made over pie and coffee during our travels. At this time, scheduled overnight stops include Las Vegas (the original one on the Santa Fe Trail in New Mexico), Shamrock, Claremore, Joplin, Lebanon, Cuba (a Friday night presentation at the Wagon Wheel Motel and the Road Crew on Saturday night at Belmont Winery), St. Louis, Union City, Tennessee, Bloomington, Illinois (the Miles of Possibilities Conference), Red Oak, Iowa, Holdredge, Nebraska, and Canon City and Cortez in Colorado. I have a new sponsor for this particular series of trips. Even better, Hualapai Lodge, Grand Canyon West Resort, is at the heart of an adventure wonderland on the Hualapai Reservation; the only road that provides access to the Colorado River in the Grand Canyon, the only two day rafting trips in the canyon, and much, much more. //ws-na.amazon-adsystem.com/widgets/q?ServiceVersion=20070822&OneJS=1&Operation=GetAdHtml&MarketPlace=US&source=ac&ref=tf_til&ad_type=product_link&tracking_id=jimhinsame-20&marketplace=amazon&region=US&placement=0760349746&asins=0760349746&linkId=7b435062b7d4cbad432c5eba0f00ab9e&show_border=false&link_opens_in_new_window=false&price_color=333333&title_color=0066c0&bg_color=ffffff Joe Sonderman has a new book coming out soon. I had hoped to pick up a signed copy during Cuba Fest, But Joe sent a note informing me that the scheduled date for release is closer to Christmas. Joe has graciously supplied numerous historic images for my books, and has written numerous books on Route 66. Needless to say, I am quite eager to get a copy, especially after being afforded a sneak peak. Next, in response to the inquiries about the Jim Hinckley’s America; A Trek Across Route 66 video teaser posted on the Promote Kingman Facebook page, the plan is for the first episode to be complete by fall. This is another project that has had an array of false starts in the course of the last year or two but I am confident that this time everything is in place to bring it to fruition. Your opinions, thoughts, and suggestions about this project would be most appreciated. You may contact me directly, or the technical folks My Marketing Designs that are behind the development of this video series. Their phone number if 928-637-6127. I was a bit surprised by the notes, emails, and phone calls received after publication of the article for the Kingman Daily Miner about the European Route 66 Festival. I know that there is an online edition but still, this is a small town newspaper. Apparently the paper took note of the international interest generated by the article as well since there is now an ongoing discussion about the possibility of me writing a weekly column on Kingman, Route 66 related developments, Route 66 related economic development, interesting people in Kingman (such as Elmer Graves and his 82 year association with the Old Trails Garage) or people that stop during their travels. The editor, however, has reservations about the possible readership for such a column and the subsequent advertising revenue that would be generated. Here is an opportunity to put in your two scents worth. Kingman Daily Miner – (928)753-6397, rthurlow@kdminer.com. 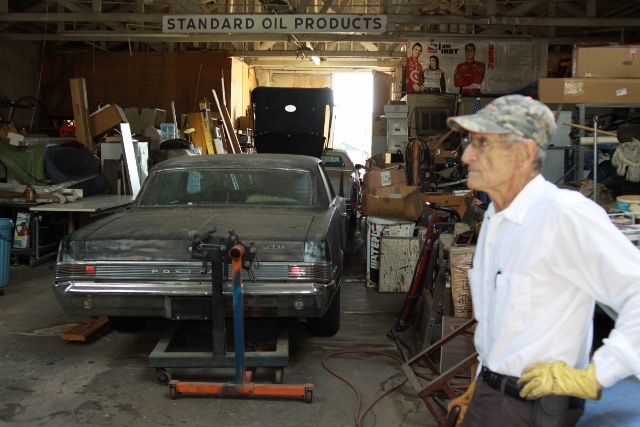 Every month the Route 66 Association of Kingman, in conjunction with a member business hosts an open house. This open to the general pubic event is a great opportunity for networking, meeting area business owners as well as community leaders, and for meeting some of the folks who travel Route 66. This month the meet and greet will take place at 6:00 P.M. on the 26th of September at Rutherford’s 66 Family Diner, 2011 E. Andy Devine Avenue (Route 66) in Kingman. The association has informed me that Wolfgang Werz of the German Route 66 Association is planning on attendance. To wrap this up, please, take a few moments to reflect on the tragic events of September 11, 2001, and the divisions that plague us today. Then give some thought as to what you can do to bridge rifts.